"This nightmarish story is incredibly propulsive and original. You won't shake it for a long time." "Diabolical, unnerving, and gives a whole new meaning to the word "relentless". Adrian McKinty just leapt to the top of my list of must-read suspense novelists. He's the real deal." 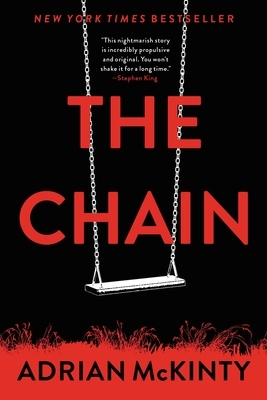 "THE CHAIN is the rare thriller that's not only fiendishly clever but also powerfully empathetic, with both hair-raising twists and complex, fully-realized characters." Adrian McKinty was born and grew up in Belfast, Northern Ireland during the Troubles of the 1970s and 1980s. His father was a boilermaker and ship's engineer and his mother a secretary. Adrian went to Oxford University on a full scholarship to study philosophy before emigrating to the United States to become a high school English teacher. His debut crime novel Dead I Well May Be was shortlisted for the 2004 Dagger Award and was optioned by Universal Pictures. His books have won the Edgar Award, the Ned Kelly Award, the Anthony Award, the Barry Award and have been translated into over 20 languages. Adrian is a reviewer and critic for The Sydney Morning Herald, The Irish Times and The Guardian. He lives in New York City with his wife and two children.